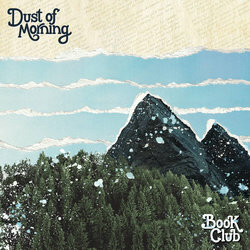 Apparently inspired by founding frontman, guitarist, singer and songwriter Robbie Horlick’s travels in Europe, Book Club’s third album, ‘Dust of Morning’ shows the Atlanta-based ensemble demonstrating a growing maturity that has them deserving of a wider audience. That isn’t to say these songs appear inspired by a particular place or places as such – the meditative and reflective nature of this indie-folk typified by the track, ‘Space Between The Days’ from which the album title is drawn: “If the dust of morning shakes/ Itself off you in great escapes/It will return to say its peace/Rearranged but thick as thieves.” Plus ca change, plus c’est la meme chose, as the French might put it. Horlick’s vocal on many of the songs has a somewhat nasally sounding intonation, reminding one a bit like an American version of Steven Adams from ‪the Broken Family Band‬. It takes some getting used to, which is why the songs in which he either alternates singing duties with Lauren Love, the band’s new pianist, such as ‘Every Song, Another Question’ or where she sings solo on ‘So Many Nights’ take on another dimension entirely – indeed, the band might benefit from giving her the lead more frequently in future. ‘So Many Nights’ is very much a highlight, Love’s sad, yearning vocal allied to a dramatic mid section which contrasts nicely with the opening verse. The songs are more impressionistic than subject-based, from the existential sounding, “Every Song, Another Question” to ‘Can You Put Your Eyes On Mine?’ in which Horlick asks a significant other to “put the phone away” – essentially a plea for undivided human connection. Always inventive, even lyrically darker, more introspective tunes such as ‘Magnetic Hearts’ and ‘It Takes A Thief,’ benefit from the sense of urgency provided by Jenna Mobley’s violin accompaniment. With rich, uplifting melodies and thoughtful, contemplative lyrics, ‘Dust of Morning’ is a record that repays multiple listens and will appeal to fans of bands such as Iron and Wine and The Deep Dark Woods.